Antimicrobial agent built into the sponge and brush fibers. You'll get continuous product protection against odor causing bacteria, mold and mildew. The pivoting scrub brush is great for loosening tough dirt and stains and works great for cleaning grout lines. Antimicrobial protection won't wear off over time, so you'll get plenty of use out of this tool. 7920002051167 "Handle, Mop, Wooden, Type I, 72" X 1-1/8""
7920014606659 "60" Screwtype Wet Mop Plastic"
7920014522030 "Lockjaw Wet Mop Hndl Fbgls 60""
With an antimicrobial agent built into the sponge and brush fibers, you'll get continuous product protection against odor causing bacteria, mold and mildew. 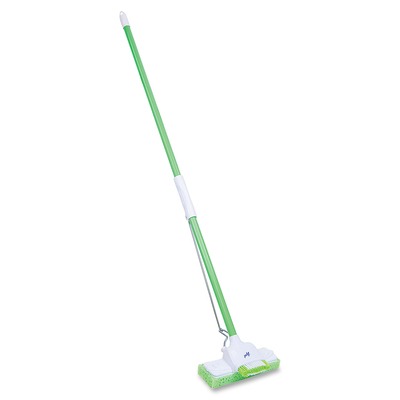 The pivoting scrub brush is great for loosening tough dirt and stains and works great for cleaning grout lines. Antimicrobial protection won't wear off over time, so you'll get plenty of use out of this tool.